Are the Ottos still keeping it real during the third American Housewife TV show on ABC? As we all know, the Nielsen ratings typically play a big role in determining whether a TV show like American Housewife is cancelled or renewed for season four. Unfortunately, most of us do not live in Nielsen households. Because many viewers feel frustration when their viewing habits and opinions aren’t considered, we’d like to offer you the chance to rate all the American Housewife season three episodes for us here. 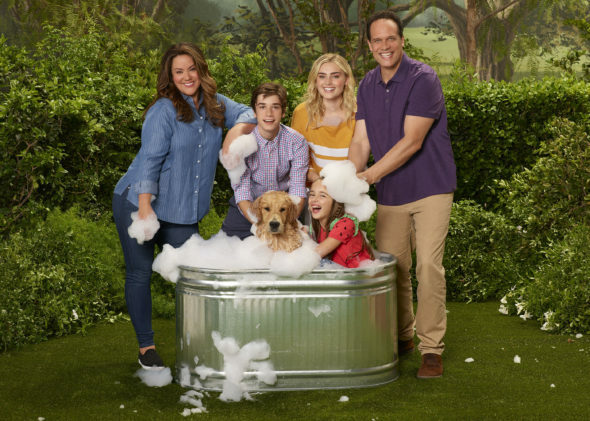 An ABC sitcom, American Housewife stars Katy Mixon, Diedrich Bader, Meg Donnelly, Daniel DiMaggio, Julia Butters, Carly Hughes, and Ali Wong. The single-camera sitcom centers on Katie Otto (Mixon). As an average wife and mother, she prefers to stand apart from Westport CT’s “perfect” parents and their entitled children. Katie’s logic-driven husband, Greg (Bader), supports her efforts as best he can. Together, they try to make sure that their kids, Taylor (Donnelly), Oliver (DiMaggio), and Anna-Kat (Butters) internalize the family’s values, so they don’t end up carbon copies of their neighbors. What do you think? Which season three episodes of the American Housewife TV series do you rate as wonderful, terrible, or somewhere between? Should ABC cancel or renew American Housewife for a fourth season? Don’t forget to vote, and share your thoughts, below. More about: American Housewife, American Housewife: canceled or renewed? Dont be too sensitive. This show is hilarious. I totally relate to the Asian mom. Its comedy so they take it to extremes, its supposed to. If it was normal people, there would be no show. I love the Otto’s. LOVE Katie. She is so real and I see myself in her character. I hate to see so many characters on TV that are all “cookie cutter” perfect. Refreshing to see someone that is a little overweight, bucking the whole healty, skinny world. Normal kids and husband too! Love it! Rock on, Katie! Some times the characters are just mean. The world is tough enough. We do not need our sitcoms to reflect the worst part of life. There is comedy in adversity not in nastiness. I think this show is awful!